Anthony's parents were something of an exception for Egyptian citizens in the lower regions of the nation--they had money and they owned land. From their affluence, they were able to provide handsomely for son and daughter even though Egypt was under the control and dominion of the Roman empire. But, they died when Anthony was eighteen years old. This left him in charge of his family estate and inheritance. The potential conflict between Anthony's faith and his family's wealth did not come to bear until he was in charge of it and charged with providing for his unmarried sister. 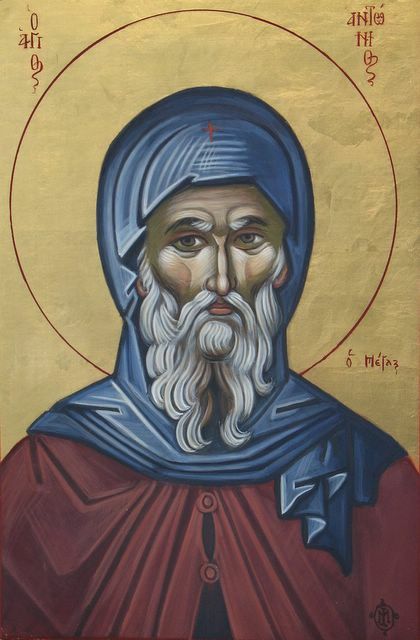 Anthony felt called to do something ridiculous--to live a revolutionary life of freedom and self-renunciation in the desert--but was anchored to the world that tempted him by his family wealth and obligation to his sister. So, it came as a pleasant surprise when his sister was willing to join an early convent so that Anthony could follow his calling. Anthony sold his family's possessions and gave the sum total of all his considerable wealth to friends and neighbors.With this radical act, Anthony set out for the desert to live into a calling. As he journeyed further into the wild, he slowly became more and more detoxified from the temptations and holdings of the world he left behind but it would be silly to believe that he simply walked away and was never again tempted to the affluence and influence of his youth. It was a long process but it came to bear very quickly with a very acute temptation as he journeyed. As he thought back to the city he had left he wondered if it was possible he had made a mistake. With poetic timing, Anthony looked down and saw a silver plate--of much value--holding a mound of silver coins. With these coins, he couldgo back and nearly regain the life he had left behind. He could abandon a hard calling for an easy and comfortable existence. He thought about it. Then, he spoke to the one he knew was behind the temptation: "Give it up, Satan, I won't be tempted." As he finished his retort to the temptation, it vanished and faded as Anthony's hopes would have had he given into temptation. As he traveled further, he found a larger, golden plate with and even larger mound of golden coins upon it. Wordlessly, he built a fire and tossed the gold into it whereupon it promptly vanished. He wasn't beyond temptation but he was slowly removing the barbs of the Empire from his flesh and gaining true freedom. 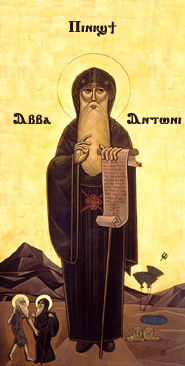 Anthony's life in the desert was the life of a monastic hermit. He secluded himself first in a tomb so that he could best devote himself to a life of prayer and service but no matter how far he got into the wilderness, news traveled back to the cities and increased the amazement of the people for Anthony's deeds. When he became sick, some Christians went and gathered him up to take him to a monastery and heal him. But when he was better, he left again and this time he found an old Roman fortress and made it his hermitage. The pilgrims who came to see the holy man spoke to him through a small hole in the wall of the fortress and received very few words back from him. He offered his teachings to his disciples but refused to be a spectacle for those who were not connected to him. He accepted gifts of food and drink but mainly subsisted upon the bread he made himself. As any monastic of legendary qualities, he was soon surrounded by disciples and students regardless of whether or not he wanted to be a hermit. He taught but he was devoted first and foremost to a life of self-renunciation and denial that blossomed in prayer and worship. When he approached the end of his life, he endeavored to finally escape one more bond upon his life and so he made his peace with his disciples. He gave away his only clothing--two cloaks. One cloak was given to Serapion his disciple and the other was given to Athanasius. 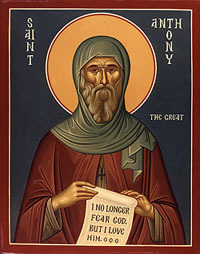 He gave his abbot's staff to Macarius and then he laid down prostrate upon the ground and died having made peace and preparation.Anthony had spent a lifetime rejecting the temptations of power and influence so that he might escape the hooks they would place in his soul. He had even gone so far as to ignore a letter from the emperor Constantine before being convinced by his disciples to at least offer a blessing by letter. For Anthony, freedom and peace were found in renunciation--even if it cost him his everything.